Pride Socks, a sock company based in Austin, Texas, sent us a huge donation! Socks for Sandy has been able to provide some warmth to so many residents of Little Egg Harbor and Tuckerton, New Jersey who lost everything in the Hurricane Sandy storm. From the hats and scarves you sent, to the gloves and mittens, not to mention all of the different kinds of socks, your generosity has been awe-inspiring and appreciated by so many in this community. 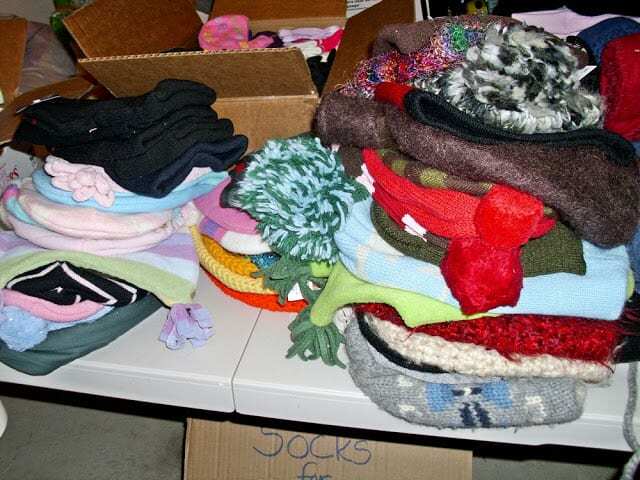 Just some of the cozy hats donated by you! 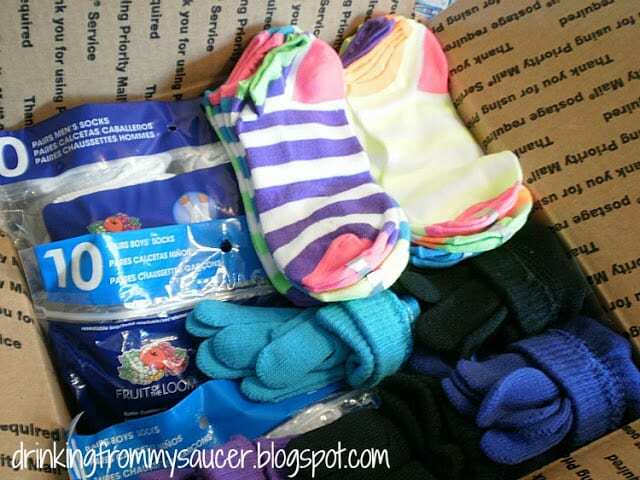 I admit that I naively thought this (Socks for Sandy) would be a short project that I would do, and that we would achieve receiving these necessary essentials quickly and be all set. Like I said: I was naive. And I was a bit premature stating earlier this week that we had enough socks. I even turned down a radio interview this week because I thought we were all set. I was wrong. You have sent in many sizes and styles of gloves and mittens! Over 800 homes in the 08087 area (Tuckerton and Little Egg Harbor, New Jersey) have been condemned. Over 4500 homes in the 08087 area have been affected by Sandy in some way, whether flooding, property damage, etc. The poverty rate in the 08087 area is currently at 45%. The needs are great, and what is needed still yet are essentials. into separate boxes to make sure everyone’s feet can stay warm! 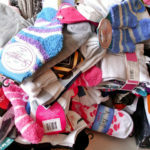 Socks for Sandy will continue, so that we can continue to provide some warmth as best we can. This is the need, and we are asking for your help. I will gladly accept all packages for the foreseeable future, at least through the New Year holiday. At that time we will reassess what we’ve received and what the needs are. For those of you who have already sent us packages and boxes, you have not only my sincerest thanks, but the thanks of so many in our community who are aware of Socks for Sandy. Please share this new request for essentials with your friends and colleagues at work, in your church groups, etc. We received a box of socks all the way from Hong Kong! For those of you who still want to help: you can! I know that I have repeatedly typed the words “thank you” and “thanks” in my blog posts, as well as on our Socks for Sandy Facebook page, but I am not sure if I could ever type or say those words enough to convey the depth of my gratitude for your help and support. Shared! and will be sending out some this week! Thanks for the list (and for everything!). Thank YOU Steph, not only for helping to spread the word, but also for your forthcoming package! I really appreciate your help big-time! I’m sending out a box tomorrow with some handmade scarves and also some cozy socks and gloves!! Thank you so much Kimberly! Your box of warmth will help so many people who need it the most right now! We sent a box from our department at my work…now we will expand to the entire company! Thank you! I really appreciate your department – and your company’s – generosity!